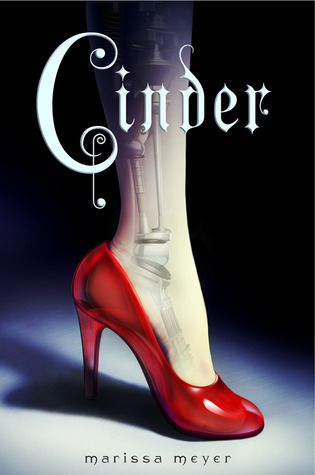 Linh Cinder is a cyborg - part girl, part machine. Her unique make-up, combined with her adoptive father's inventions in cybernetics, allowed her to become the best mechanic in New Beijing at the tender age of sixteen. Her talents become so widely known that one day the crown prince himself brings an android for her to fix, and while he tries to make light of the subject, it's apparent that it's a very serious matter. Unfortunately, Cinder's life is not all roses and sunshine - a deadly plague ravages the Earth, and cyborgs are drafted all over as experimental subjects. When Cinder's younger sister Peony falls victim to the plague, her stepmother immediately signs her up as a volunteer for the study, even though nobody has survived it. And when the scientists start working on her, it becomes apparent that she is a lot more than you ever expected. I've wanted to read this book for ages! No, it's not the hype. Even before. When I started off at livejournal a couple of years back (mostly to write Kaleido Star fanfiction), a friend of mine pointed me towards Marissa Meyer's blog, and I have been hooked ever since. I read about Cinder and was half in love with it before it was even queried, so is it that much of a surprise that reading the actual book made my head explode? How can I even articulate my love for this book? Let's just say that between this and Daughter of Smoke and Bone, I may never read YA the same way again. I mean... wow, just wow! First of: the characters. So well-crafted, so real! Cinder is an absolute joy to read - she's smart, she's strong-willed, she's realistic sometimes to a fault, and also a little bit romantic. She's painfully aware of how bad the situation gets, and unlike any other heroine I have ever read, keeps her focus throughout the book. Not once does she let her feelings for Kai overshadow her judgement (or common sense), and while she does acknowledge them, she really does have her priorities straight. And Kai! I could buy this guy a drink and then listen to him spill his troubles to me all night long. I'm that pathetically in love with him. I mean, he's just... he's just like you'd imagine a fairytale prince to be. Totally swoon-worthy, no wonder every girl in the Commonwealth is in love with him. It's like... he's a prince, but that's not his defining feature. Instead, he's a man, who happens to be a prince, and who tries to deal with the difficulties thrown in his path the best way he can. He's not a fool - he knows exactly what responsibility rest on his shoulders, but instead of angsting about it like any other male lead in YA, he just deals with it, because there is no-one else who can do it. Speaking of love, this book gets even more brownie points for having the romance develop at a believable pace. There is no insta-love (although there is attraction) - Cinder and Kai interact many times throughout the book, and each time they discover different facets of their personalities. Their interactions are very genuine, very down-to-earth. It's amazing. And it's not just these two characters - from Peony and Pearl, the stepsisters, to Dr. Erland's assistant Fateen are well-developed, three-dimensional characters. A very poignant scene in the beginning of the book is Fateen confronting Erland for only testing on young girls, and giving males placebos. It's a small scene, and yet it makes me go back to it, again and again. Strong female characters are all around the table, and Cinder shines bright amongst them. But enough about characters, what about the plot, you say? It's a futuristic retelling of Cinderella, but oddly enough the things it has in common with the Perreaut story are: the poor girl, the step family, and the ball. This book is part fairy tale, part political intrigue, part sci-fi adventure, and let me tell you, it all works fantabulously. There are so many subplots, intricate details and whimsy that make your head spin, in a good way. So what else is there to say but: read this book. Or preorder it. I promise, it's worth it. And if you find it's not... well... I'll review "Silence". Coming up next: Katya recounts her experience at this years Bath's Festival for Children's Books.